The bravery and quick response of U.S. Capitol Police prevented Wednesday's shooting at a Northern Virginia baseball field from becoming a "massacre," congressmen at the center of the terrifying ordeal said. House Majority Whip Steve Scalise, one Capitol Police officer, an aide to Rep. Roger Williams, R-Texas, and a Tyson Foods lobbyist Matt Mika were shot and wounded Wednesday morning as the Republican congressional baseball team held an early-morning practice in Alexandria, Virginia. Police previously said that five people had been shot, but they have corrected the number to four. 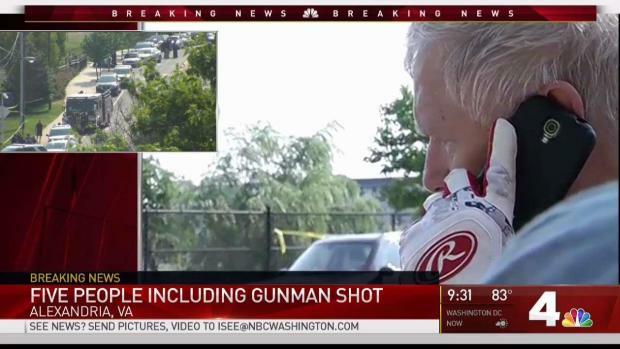 The gunman, identified by NBC News sources as James T. Hodgkinson, from Illinois, was wounded after trading fire with police. He later died from his injuries, President Donald Trump said. 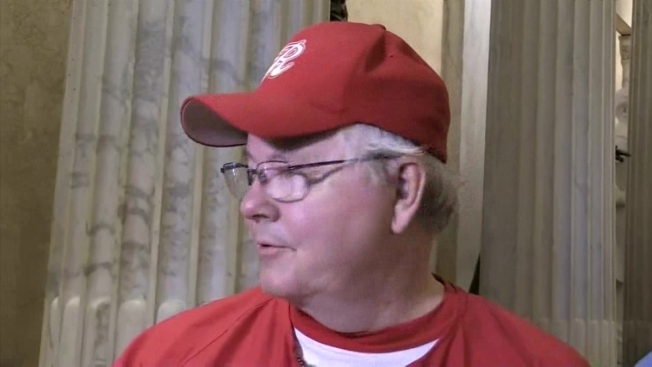 Sen. Rand Paul, R-Ky., Rep. Mo Brooks, R-Ala., Sen. Jeff Flake, R-Ariz., and Rep. Joe Barton, R-Texas, recounted their harrowing experiences in television interviews Wednesday morning, saying U.S. Capitol Police officers distracted the shooter and ultimately wounded him, saving more people from being shot. Congressman Steve Scalise of Louisiana, along with multiple others, was shot this morning during baseball practice at a park in Alexandra, Virginia. The shooting victims were practicing for a Congressional baseball game scheduled for the next night when a lone gunman opened fire on the crowd. 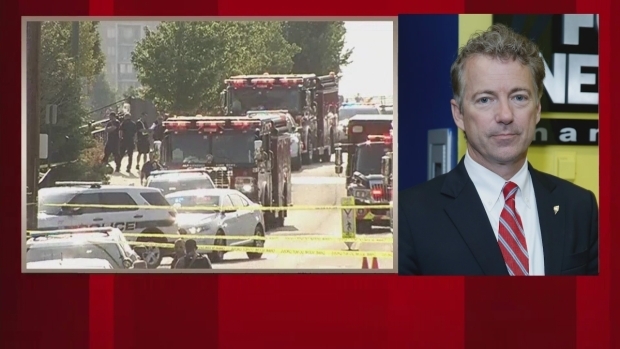 Senator Rand Paul was at that practice and says if it weren't for Capitol Hill Police on the scene, the shooting could have been much worse. "After the first shot, then there was a rapid succession of shots, five or 10 shots," said Paul, who was in a right field batting cage when the shots first rang out. “In the field, I see Representative Scalise is shot but moving and he’s trying to drag himself through the dirt out into the outfield." At the same time, Brooks said he and others near the infield dove into the first-base dugout to hide from the shots. Brooks said he and others in the dugout aided a wounded staffer until officers began firing back at the shooter. "I hear loud explosions. I look up and there’s a man with a gun. Fortunately, he’s a good guy," Brooks said of a Capitol Police officer. "He’s shooting back across the in field at the man with the rifle." Brooks said the return fire distracted the gunman until he was downed by the officers. "The only chance we had was the Capitol Police," Paul said. "Had they not been there, it would’ve been a massacre… There’s no escaping a guy if he’s got several hundred bullets and we’ve got no weapons and no place to hide." Sen. Flake described calling Scalise's wife after Scalise was taken by the ambulance. "I didn't want her to hear it on the news," he told NBC News. "[Scalise] dragged himself after being shot to off the infield and into the outfield to get a little further away from the gunman," he continued. Choking up as he spoke, Barton recounted a similar scene. "Scalise's security detail and Capitol Hill police immediately began to return fire and Alexandria police also immediately came and began to return fire," he said. Barton, the team manager, said he took cover behind a dugout when the shooting started. His 10-year-old son was also on the field and dropped to the ground. "I was getting down, making sure my son was down," Barton said. Just prior to the shooting, at about 7 a.m., two congressmen who left practice early said they bumped into the man they now believe was the shooter, and he asked them whether the people practicing were Democrats or Republicans. Rep. Jeff Duncan, R-SC, and Rep. Ron Desantis, R-Fla., were getting into Duncan's car when the man asked them for the political affiliation of those on the field. 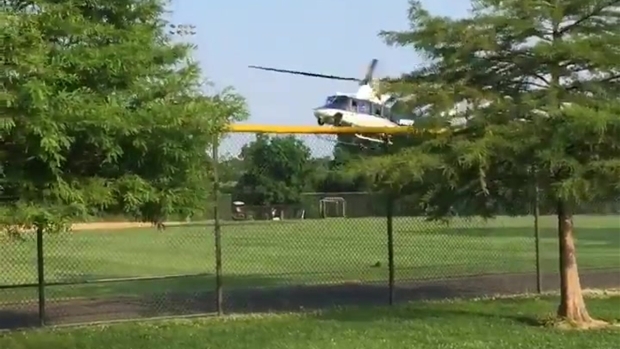 A medevac landed in Alexandria, Virginia, after reports of shots fired at a baseball field where congressional Republicans were practicing. House Majority Whip Steve Scalise was reportedly shot. "I told him they were Republicans," Duncan said. "He said, 'OK, thanks' and turned around. I got in the car and left, and found out later that my Republican colleagues were targeted by an active shooter." The two Capitol Police officers were wounded in the shooting, authorities said. Both are expected to survive. Brooks said even after one of the officers was wounded, he limped toward the outfield in an attempt to help Scalise. "He’s loyal to the person he’s assigned to protect," Brooks said of the officer. "So even though he’s wounded ... he’s trying to make sure Steve Scalise is going to be ok."